Also in developing Asia, the Indian construction equipment market is set for a third consecutive year of double-digit growth. Demand is expected to rise 16 per cent in 2018, following on from the 15 per cent increase seen last year and the remarkable surge of 39 per cent enjoyed in 2015. This is expected to take earthmoving equipment sales this year above the 70,000 unit mark for the first time and push the value of the Indian market to a record US$3.5 billion. This year is also seeing strong growth in North American equipment demand. There was a hiatus in sales in 2016 due to uncertainty in the run-up to the election. Growth resumed in 2017, taking volumes back to their 2015 levels. This year sales are expected to rise another 13 per cent to almost 200,000 units. Like the North American market, demand for equipment in Europe is at a good level. Sales exceeded 160,000 units last year for the first time since the global crisis, and in 2018 the market is expected to edge up to 165,000 machines. However, this is expected to represent the high-water mark for Europe in this cycle. Japan is one of the few construction equipment markets not expected to grow this year. Although demand should edge up over the coming years, the Japanese market will remain relatively small at 60,000-65,000 units per year. Elsewhere in the world is proving somewhat mixed. Developing Asian markets improved strongly in 2017 and are generally continuing to improve this year. However, both the Middle East and Latin America remain very weak, although growth seems to be returning. 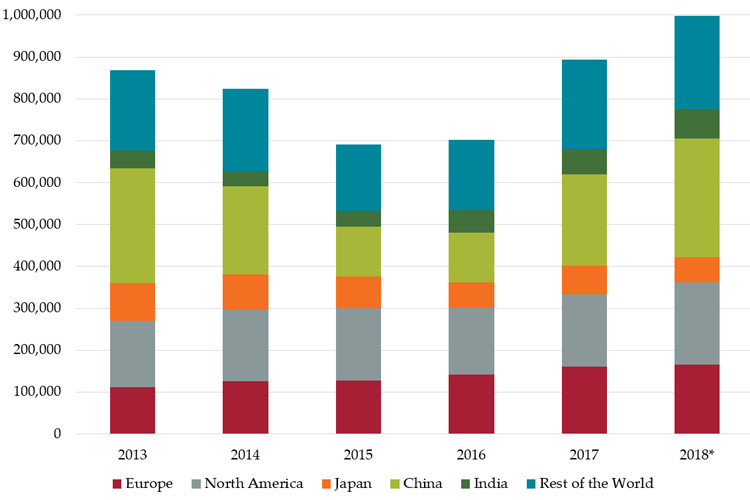 Global equipment sales over the medium term are expected to stabilise around the 1 million units per year mark, with a retail value of around US$100 billion. Subscribers can click here to log in to access Off-Highway Research’s latest forecasts from the Chinese, Indian and International Database Service and the Global Volume & Value Service and the Global Volume & Value Service PLUS. Non-subscribers can contact mail@offhighway.co.uk to enquire about a subscription.